... you might find this guy lurking around! 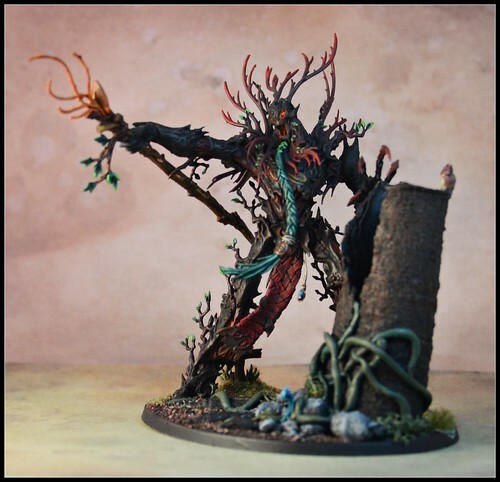 The new Treeman kit from Games Workshop was just such a nice looking model that I had to grab myself a box and have a go making one, even if I don`t actually play Fantasy Battles. This was just a case where the painter simply had to have a go. The box allows for any of three variants to be made, so there are a bunch of extra parts and options, which meant it was perfect for some light conversion and creating a base that would really set him off! The model is definitely very visually `busy`and I struggled with the colour scheme quite a bit as I worked on him. In the end I went for a kind of autumnal feel, with deep, dark, reds and oranges, and then created some contrast with the greens for the leaves and his beard. I also had a lot of fun creating the base. Re-purposed some real tree bark, and then used green stuff to fashion some rocks and vines, and finished it off with some of the critters included in the kit itself, and a mix of the army painter shrubs and grasses I had lying around in my modelling supply box. All in all pretty pleased with this one!